The Music Department of the University of Delaware has put on some amazing concerts over the years. Their latest Mendelssohn Festival with The Calidore String Quartet as visiting guest artists is an ambitious undertaking with all of the published string quartets of Felix Mendelssohn and his Octet for Strings, performed with UD's Ensemble-in-Residence, Serafin String Quartet. The Calidore Quartet was founded in 2010 while the members were in Los Angeles studying at the Colburn Conservatory. They discovered their potential as an ensemble when they first began to work on the Mendelssohn String Quartet, Opus 13, which was actually the composer’s first mature string quartet, although it was the second to be published. Mendelssohn was 18 years old he wrote this quartet, and although his prowess as a pianist was well known, he actually played violin and viola quite well, so his composition for both instruments came from a thorough knowledge of how they were played. He, like Beethoven, put a lot of emphasis on the middle voices. Both Estelle Choi, cello and Jeremy Berry, viola are able to bring these voices to the fore without dominating the ensemble’s sound. The first two movements of Four pieces for quartet, Opus 81 feature the viola leading the melodic chase, but the cello also has a big and dominant part in the Tema con variazioni which segues into a brief but thrilling Presto. Choi’s vibrant tone and acute attention to detail makes the harmony for the quartet work. In all of the music of the first two days of the festival, the sound was so well blended that it seemed almost to be performed by a single musician. First violinist Jeffrey Myers, a tall and lanky man, leans into his violin, tilting his head to the left as if to hear himself better. But then he turns to the other players before lowering the sound of the violin as he plays in the low register, to just the point at which you can hear his soft melodic line over the others, who manage to play even softer at the end of the Allegro vivace of Opus 13. As the recapitulation of the theme (Mendelssohn’s short song: Ist es wahr?/Is it true? ), the quartet diminishes the sound to the softest nothing as they reach the final chord. When the two violinists Jeffrey Meyers and Ryan Meehan trade off the melodic lines in the Scherzo of the Four pieces for string quartet, Opus 81, it is impossible to tell who is playing. Their innate ability to match each other’s intonation and bowing make it sound like a single line of music. Each of them also have a solid sound in the low register of the violin which projects well, even at a soft dynamic. The Calidore played the String Quartet Opus 44, No. 3 so fast that the sixteenth note patterns which come after the repeat in the Allegro vivace sound like trills — magically even and exciting. They played the fourth movement, Molto allegro con fuoco, with very big sforzandi, giving the entire movement a playful, roller coaster feel. When they played the last quartet written by Mendelssohn, Opus 80, they talked about how he wrote this after his beloved sister Fanny died suddenly. He used this very beautiful piece as a metaphor of his grief, writing a wailing and sustained high B-flat for the first violin, which Jeffrey Myers managed to make a delicate cry of anguish. Having a quartet of this caliber visit the Gore Recital Hall, with its fine acoustics for such intimate concerts, is a treasure. The Calidore have won impressive international chamber music competitions. They have a wide range of repertoire, including some dissonant and modern pieces like the Anton Webern Five Movements for String Quartet, Opus 5, which you can hear online here. And if you miss the Mendelssohn Festival, the Calidore Quartet’s mentors, the Emerson Quartet, will appear at the University of Delaware on Sunday, April 30. See www.music.udel.edu or call 302.831.2577. The Delaware Theatre Company (DTC) ends its 2016-17 season with the American premiere of the London smash hit family musical, Hetty Feather. 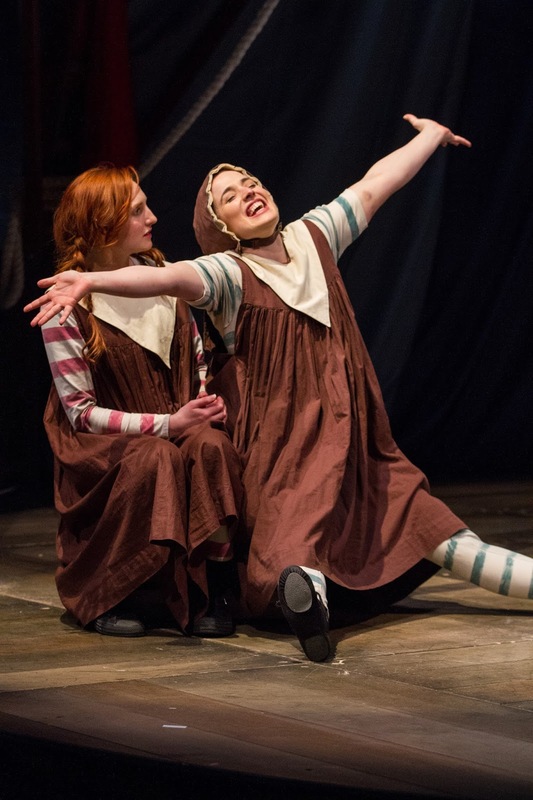 Emma Reeves’ adaption of Jacqueline Wilson’s beloved book about a headstrong orphan girl’s adventure to find her true home will delight young theater goers. However, the mature themes of abandonment and loss in the story will also intrigue adult audience members. The Cast of Hetty Feather. Photo by Matt Urban, Mobius New Media. Hetty, played by the wonderful Clare O’Malley, is on a quest through Victorian England searching for her birth mother. Being an unwed woman during this time, Hetty’s distraught and sadden mother had no choice but to leave her infant daughter at London’s Foundling Hospital (a public institution for abandoned children). Shortly after arriving at the hospital, Hetty is sent to a foster home in the countryside where she spends the first six years of her life. The headstrong heroine never loses her insatiable desire to find her birth mother, even though she forms a strong bond with her foster mother and three brothers. While living with her foster family, Hetty develops a keen imagination that will later serve her well. Hetty, like all foundling children, must return to the hospital following her sixth birthday. Under the stern supervision of Matron Bottomly (chillingly played by Michael Philp O’Brien), life at the hospital is cruel and unforgiving. Living in such harsh conditions, Hetty becomes even more driven to find her legitimate place in the world, but to get there she must go on a journey that will take her to bleak places where she must face tumultuous situations. Photo by Matt Urban, Mobius New Media. Director Bud Martin has created a charming, yet sinister, production that at times delights as well as frightens. His brilliant ensemble cast creates their characters on a circus set which provides a great juxtaposition to Hetty’s plight. 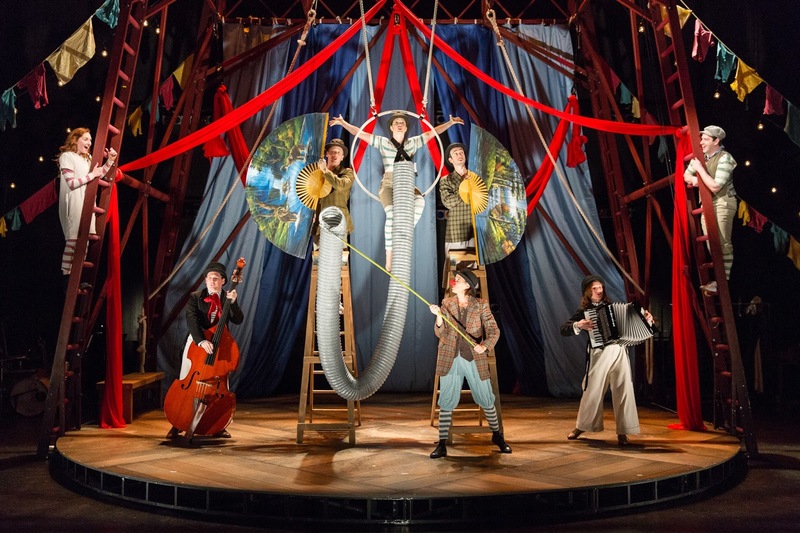 O’Malley and O’Brien — along with their stellar co-stars (Terry Brennan, Dave Johnson, Rachel O’Malley, and Karen Peakes) — have the daunting task to act their parts while performing circus stunts. For most of the show, the actors are hanging from flowing sheets or a ring that dangles above the center of the stage. 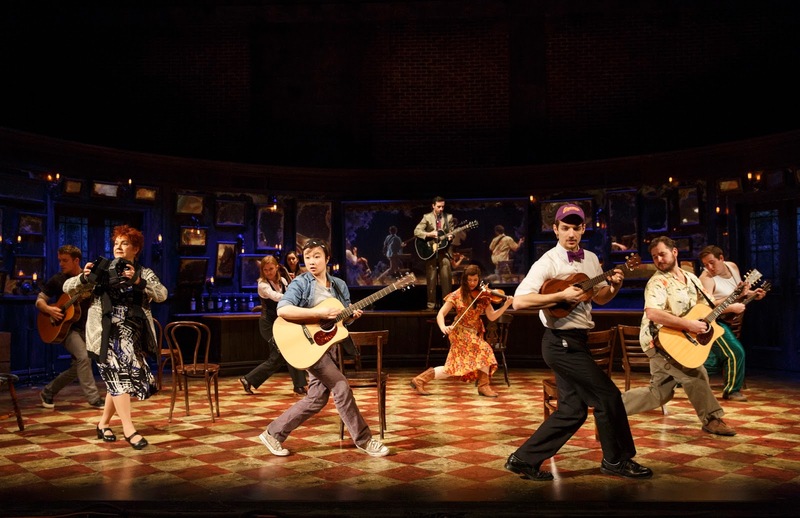 It’s amazing how effortlessly they make it look to stay in character as they climb, swing and perform high above the stage.The cast is flawlessly costumed by Katie Sykes. Her understated costumes, some including a hint of a clown suit, not only capture the grim look of the poor during the Victorian period, but also let her circus set shine. 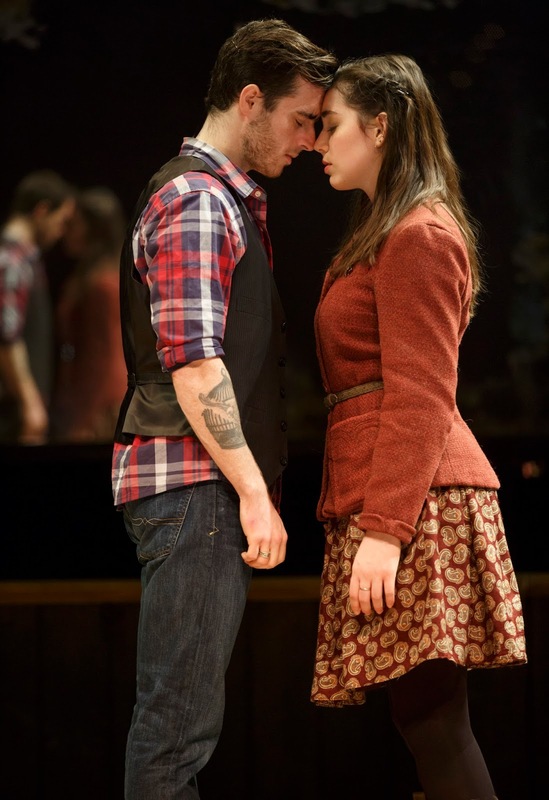 The stage was built so the fantastic musicians (Liz Filios and Josh Totora) have an area to create mood music and flow easily in and out of scenes. 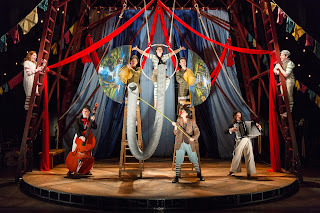 In addition to playing their instruments, Filios and Totora provide the vocals for most of Bendi Bower’s score, leaving the actors to focus on their characters and circus stunts. Hetty Feather isn’t your traditional family show or musical, but that makes it a special treat for the whole family. DTC recommends the show for children ages 7 and up. Hetty Feather runs through May 14. For tickets and additional information, call 302.594.1100 or visit www.delawaretheatre.org. Symphonies by Haydn and Schubert got a well-deserved reception at the penultimate concert of the Delaware Symphony Orchestra’s chamber series at the Hotel du Pont’s Gold Ballroom on Tuesday. March 21, 2017. It was a trombone concertino by Swedish composer Lars-Erik Larsson, though, that piqued the interest of concertgoers. Little surprise there. Compositions featuring solo trombone are rarities on classical music programs. But the trombone has come a long way. No longer does it have to remain content to sit at the back of the orchestra idly counting rests. The repertoire for it has grown — albeit slowly. Natalie Mannix, principal trombone for the DSO, was outstanding in this relatively obscure Mid-20th Century work. Her playing was sensitive and passionate; her tone noble and commanding. In the second movement, her instrument vocalized a soulful melody across a wide range of pitches and dynamics. The orchestra provided proper support. The third movement displayed a tongue-in-cheek humor: Its ponderous notes poking fun at the pompous blasts of the outer movements. Schubert’s much-loved Symphony No. 5 in B flat needs no further introduction. Maestro David Amado’s intimate rendering harkened back to the kind of performance Schubert’s family orchestra might have given. The result was a clarity that revealed the composer’s often overlooked skills as a contrapuntist as well as the delightful writing for the horns. Cellos and basses were also given a real presence here. Add to that sensible tempos — has the trio section of the third movement ever been more lovingly played? — and the right touch of the dramatic and you had one of the most graceful and charming interpretations anyone could ask for. The concert opened with performance of Haydn’s Symphony No. 59 in A major (the Fire Symphony). This is indeed a fiery work, with many traits placing it squarely in the composer’s so-called Sturm und Drang group of symphonies: Driving rhythms, unusual harmonic schemes and sudden contrasts in orchestration and dynamics. Amado gave free rein to the horns, allowing them to deliver all the effects Haydn conjured up for them. Throughout the work, these spectacularly difficult parts were played by John David Smith and Lisa Dunham with remarkable accuracy and skill. Mélomanie, the critically acclaimed ensemble known for its provocative pairings of early and contemporary works, capped off its 2016-17 season with a program tilted a bit more toward the contemporary than usual. Joining regulars Kimberly Reighley, flute; Christof Richter, violin; Donna Fournier, viola da gamba; and Tracy Richardson, harpsichord were guest artists Naomi Gray, cello and Joshua Kovach, clarinet. Mélomanie performs at The Delaware Contemporary near the Wilmington Waterfront. Mélomanie also welcomed flutist/composer Bonnie McAlvin whose work Sandstone Peak received its World Premiere at this concert. McAlvin explained how her fascination with mountains — in this case the highest peak of the Santa Monica Mountains — inspired the composition. The work is in four movements: Illusion, Conversation, Throne of Sand and Everywhere at Once, throwing a nod to Richard Bach’s Jonathan Livingston Seagull. McAlvin is a clever composer who skillfully adapts the serial technique to tell a story of illusion, erosion and feeling exposed. Throughout the composition, the row becomes dismantled and recombined reappearing in each movement in various guises and instrumental textures. The effect is one of fantasy and vulnerability. Gray and Kovach combined their talents to perform Private Games by Israeli composer Shulamit Ran and Night Music by Parisian Nicolas Bacri. The former is a brief, jagged work full of disjointed gestures that somehow manages to convey a lyrical underpinning. The duo — both as an entity and as individuals — tossed off the fiendishly difficult passages with grace and ease. They convincingly brought out the chill in Night Music, a non-lyrical piece that glumly muses suggestions of inimical fate. Richardson, Reighley and Kovach collaborated in a charming performance of the Sonatine en Trio, Op. 85 by Florent Schmitt, the most important French composer you probably never heard of, according to self-styled Schmitt expert Phillip Nones, who offered his thoughts on the composer and the work. Schmitt (1870-1958) had no affinity for atonality or neo-classicism. Instead, he composed lushly lyrical music bursting with a profusion of ideas. Nones noted that this particular work has also been scored for flute, clarinet and piano as well as violin, cello and piano. But the musicians noted, in a post-concert discussion, that the harpsichord gave the work a lighter, brighter tone. The flute and clarinet combined to produce another interesting aural feature. At times they seemed to blend so thoroughly that resulting sound was neither that of flute nor that of clarinet but a seemingly altogether different instrument with a sound all its own. Vittorio Rieti’s Variations for Flute, Clarinet, Violin and Cello on When From My Love by John Bartlet was written in 1964 and dedicated to the memory of composer Paul Hindemith. This was a charming performance of this delightful little work consisting of nine variations and a code. It was an apropos selection for a Mélomanie program, as it combined the baroque with the contemporary. 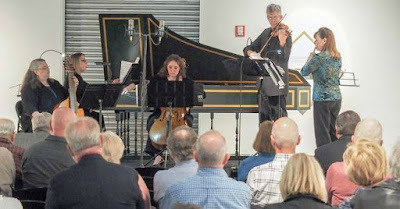 The musicians of Mélomanie gave a nod to the Baroque with a performance of Marin Marais’ Suite 6 n C minor (from Pieces en Trio 1692) which preceded the two halves of the program. The ensemble’s final performance for the 2016-17 season will be a special Mother’s Day Brunch and Concert on Sunday, May 14. Tickets are available at www.melomanie.org. Pyxis Piano Quartet performs at Market Street Music. Market Street Music welcomed spring and Pyxis Piano Quartet to its Festival Concert series on Sunday, March 19, 2017, which paired Beethoven’s String Trio in G major with Faure’s Piano Quartet in C minor. The Opus 9 string trios offer a fascinating portrait of the young composer bursting with ideas as he took a musical form born as the baroque trio sonata and gave it new life as only he could. But as striking as they are, they represent the last gasp for a form that would soon be eclipsed by the string quartet. Pyxis wisely chose the first Trio of Op. 9, a gem from its opening note to its last. This performance of the longest and most difficult of the trios earned the ensemble a well-deserved ovation. The opening and closing movements were technically perfect in every dimension. The wonderful slow movement with its pastoral theme in the distant key of E major received a most moving, heart-longing treatment. 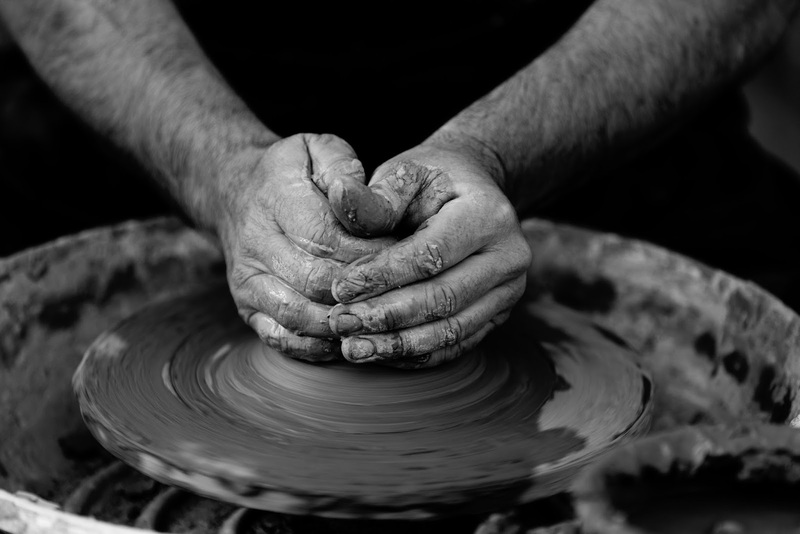 The breadth of expressiveness was especially remarkable considering the movement’s simplicity of form. 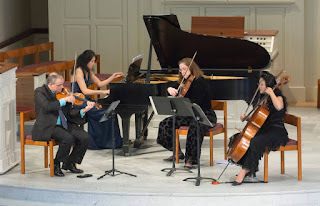 Violist Amy Leonard introduced the Faure Piano Quartet by telling the audience that while she and her colleagues couldn’t offer Paris in springtime, they could bring a bit of the city into First & Central Presbyterian Church. Leonard also noted that while the work is cast in a minor key, it’s a “happy minor,” with a positive tone albeit with some hints in the slow movement of the turmoil in Faure’s personal life at the time of composition. Leonard contextualized the work by noting that just as Beethoven was a transitional figure between the Classical and Romantic periods, Faure stood at the crossroads of the Romantic and modern eras. Indeed, Romanticism and its doleful heroics are left behind in this work. The first movement is a fluid blending of energy and lyricism. The high-spirited and virtuosic Scherzo delights with pizzicato-pricked perpetuum mobile fantasy. The grand Adagio imbues profound passion with classical restraint and balance. A soaring Allegro caps all with a shimmering major/minor gaiety. Balance, ensemble, superb intonation and sensitive interpretation characterized this performance. None of the loud passages were overplayed. When one player had a solo passage, they came out just enough then returned to their dynamic place. Special honors go to pianist Hiroko Yamazaki. Pianists have a special balance problem when playing in quartets because the sound of their instrument is so much fuller than a single string instrument. Not so here. Yamazaki was always at the correct level. Quite remarkable! at Market Street Music. Photo by Joe Gawinski. If you have never been to one of Market Street Music’s Thursday Noontime Concerts, it is worth organizing a trip to First & Central Presbyterian Church. The concerts are only 30-minutes long, so they would serve as a gentle introduction for a person who is new to classical music. The selections are varied and intriguing – a taste of music by local performers. The performance was beautifully controlled and the quiet attack and gradual build to the climax and fading away to nothing was also like an ocean wave, but this was slightly different from what Mr. Barber had originally put in his score. When I listened to a 1983 Nonesuch recording of the work with Leslie Guinn and the New York Art Quartet, the cover notes by Phillip Ramey quoted his 1977 interview with Mr. Barber. Barber said of Dover Beach, “Originally, I cut the middle part about Sophocles. Soon after Dover Beach was finished, I played it at the Owen Wister house in Philadelphia and Marina Wister exclaimed, ‘Be where’s that wonderful part about Sophocles?’ (Conversation was at a high level at those grand Philadelphia houses – if you said Sophocles when you meant Aeschylus, you simply didn’t get another drink.) I realized that Philadelphians, who are infinitely more educated than New Yorkers, would know their Matthew Arnold, and that she was quite right, so I wrote a contrasting middle section. The piece was better for it.” And I agree. The second piece in this mini-concert was String Quartet No. 1, which Charles Ives composed when he was 21. He used some well-known tunes, in particular hymns. Ives’ harmonizations in this early work were exploratory and sometimes use clashing dissonances. 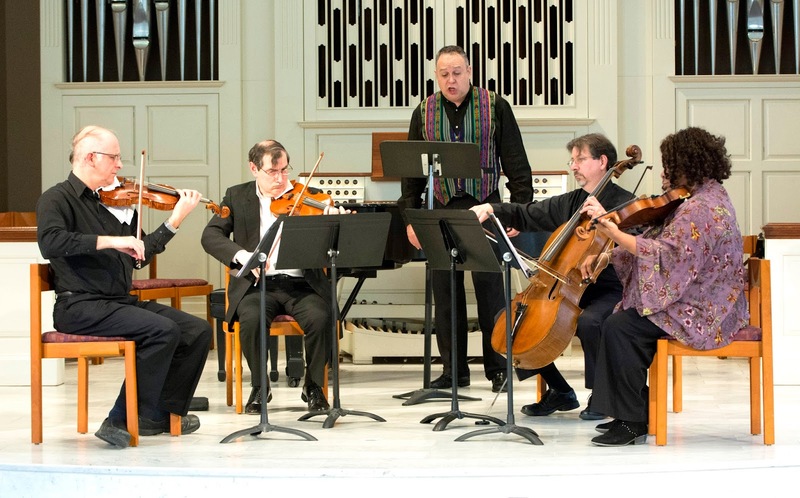 The Copeland Quartet, with Ross Beauchamp as their guest cellist in this concert, unfurled the canonic harmonies of the fugal first movement and took their time ro permit clarity in the very acoustically live sanctuary. Ives became more daring with his harmonies with each successive movement. The fourth and final movement was a glorious experiment in harmonic changes and 3/4 over 4/4 meter – reprising the Shining Shore theme from the second movement, the Coronation from the first, and a smattering of the hymn tune Stand up for Jesus. The effect was described by my companion as ‘a sandbox of harmony”. The quartet played the difficult piece with panache, showing us how, as another member of the audience noted, that without Charles Ives there would have been no Aaron Copland. Upcoming Market Street Music concerts are Minas on Thursday, April 6 and OperaDelaware Sneak Preview on Thursday, April 20, both at 12:30.